When it’s time to buy, a buyer will reach out to a seller who left a memorable impression. No one likes to start from scratch and take a chance. No one likes to go through the vetting process of talking to multiple sellers (and then dodging their follow-up calls for months). We’d all prefer to have a seller top-of-mind who has already become memorable. Why not be that seller? In the networking you do, be memorable. In the prospect and outreach calls you do, be memorable. With every buyer who says “yes,” be memorable. One way to be memorable is to proactively give to your buyers (including prospects!). In this series on how to be a memorable salesperson, we’re covering 12 different ways you can ensure that YOU are the seller who stands out in buyers’ minds. 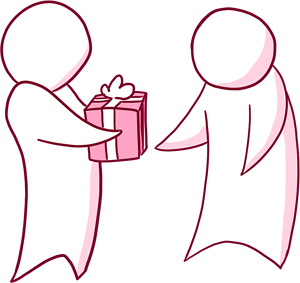 How Will Being a 'Giver' Help Me Be a More Memorable Salesperson? The unfortunate reputation of sellers is that they are greedy, self-centered, and in it only for the money. Sellers are seen as takers. Being a giver instantly differentiates a seller and severs that association with unfair stereotypes. Being a giver has another advantage. Let me preface this one by saying it is not meant to be misused for manipulating people. If you give in order to get, your self-serving tactics won’t pass the sniff test with most buyers. Give to be a giver. When you do, the Law of Reciprocity kicks in. The Law of Reciprocity is based a powerful psychological urge. It’s human nature that we want to do something for a person who has already done something for us. In sales, what you’re typically needing from a buyer is their time. You give something and, in exchange, they will give you their time. During that time, you give them something more and make yourself memorable, too. What Can I Do to Give Before Asking for Something in Return? You won’t become more memorable by giving buyers a discount, added value giveaways, or time to think about your proposal. Those common giveaways are not differentiating because virtually every seller offers them. We talked in a previous post about providing a Customer Experience to become more memorable. (Find the whole series on the CONNECT2Sell Blog site.) CX is the new differentiator of choice. What that means is that everyone else is moving this direction, too. The experience you provide will need to stand out and be relevant and personalized. One of the tools you can use to become more memorable is purposeful questions. With strong questions, you can make your buyers think in new ways. You can promote self-discovery. This is much more compelling than telling them why they need your product/service. When they come to that realization and magnify it themselves, they will be more motivated to buy. Obvious but often overlooked is the individual value you can offer. Not the value of your product or brand, but the value of YOU. You have information that would be of interest to your buyer. Beyond information about product features, you know what’s happening in the industry and community. Similarly, you have connections and can make introductions that benefit your buyer. They may not benefit you in the short-term, but being a giver makes you memorable and “paying it forward” is smart business. Depending on what you sell, perhaps there is an opportunity to give your buyer a sample of your product. This might include a hands-on demo where they get some benefit of temporarily using your product. It might include content that is high value. As much as possible, let them sample your product and get attached to the idea of using it. When the car dealership encourages you to take the car for test drive, this is what they’re doing. They know that if you love it, you’ll be more likely to buy it. You can also give your buyer proof and confidence that working with you will be a good choice. Referrals, case studies, relevant research, and following through on your promises all prove you can be trusted. Give your buyer reasons to meet with you and feel good about doing so. In every interaction, aim to give your buyer value. Their time is precious, so make those minutes count. Don’t waste time on irrelevant data, features, or chit chat. Engage the buyer with thought-provoking, two-way dialogue. Be sure that what you offer is meaningful for the buyer. Involve them in collaborating to craft solutions. Work alongside your buyers to help them meet their business goals. Sometimes, sellers fail to give in these ways in order to protect their own time. This is where “Deb’s #1 Rule of Selling” comes in handy. The rule is E = O. That’s Effort = Opportunity. The amount of time and effort you invest in any buyer should be proportionate to the size of the opportunity. Don’t yet know the size of the opportunity? Initiate the connection by giving something to see what comes of it. Be proactive in your giving so you become memorable. Don’t worry about giving too much in these seven areas – the payoff is worth it when you make these kinds of investments. How Can I Learn More About Proactive Giving and the Law of Reciprocity? The book that comes to mind right away is Bob Burg’s The Go-Giver. If you’ve never read it, you’re in for a treat! If you’re interested in learning more about the law of reciprocity and other techniques for persuasion, the book for you is Influence: The Psychology of Persuasion by Robert Cialdini. If you prefer webinars, here’s a resource with hundreds of free webinars from the world’s leading sales experts. Go to The Sales Experts Channel and click on the archive section called “Sales Success” for numerous presentations about the kinds of giving described above. And don’t forget to work on additional ways you can become more memorable, too. Stick with this series to read more about buyer research and field observations with sellers. Check out this video playlist on the People First PS YouTube Channel with more tips and research with buyers. There are 25 videos there, each one lasting just 3-5 minutes. Read the book that started it all. DISCOVER Questions® Get You Connected is packed with ways you can make yourself more memorable to buyers. It was ahead of its time in bringing research with buyers directly to sellers. Whatever you decide to do, make a commitment to become more memorable. Standing out in a crowded sea of sellers is a surefire strategy for boosting your sales success.